Lynne Schaefer, vice president for administration and finance, University of Maryland, Baltimore County (UMBC), becomes the 2018–19 chair of the NACUBO Board of Directors on August 1. She succeeds Mary Lou Merkt, vice president for finance and administration, Furman University, Greenville, S.C. 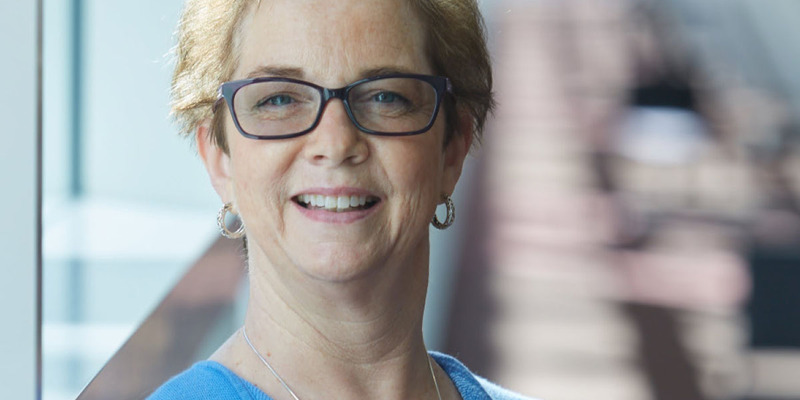 In her role at UMBC, a public research university with nearly 14,000 students, Schaefer is responsible for financial management, budget, and reporting and control for annual operations exceeding $450 million. She also provides leadership for facilities planning, construction and operations, human resources, environmental safety and health, dining services, bookstore, campus police, and general business services. Prior to her role as chief business officer at UMBC, where she has served since 2005, Schaefer was the CBO at Oakland University, Rochester, Mich. Starting in 1998, Schaefer served as vice president for finance and administration at the public university with more than 16,000 students. She served as a member of the president’s cabinet, and was responsible for financial management and reporting, investment and treasury management, budget development and control, financial systems, property management, facilities design, construction and operations, human resources, risk management, auxiliary services, campus police, and university business services. Prior to her tenure at Oakland, Schaefer spent nine years at Wayne State University, a public research institution in Detroit. During her years of service, she served first as the institution’s budget director (1988–93) before being promoted to vice president for administrative services—a position she held for four years (1993–97). Before entering the higher education sector, Schaefer held various positions within Michigan’s state government, including at the state budget office, the treasury department, and the governor’s office. She also held the position of president at the Michigan Education Trust, one of the first guaranteed tuition investment vehicles in the U.S.
Schaefer earned her master’s of business administration in finance from Wayne State University; and a bachelor’s degree in political science from Michigan State University, East Lansing. Schaefer has served on the NACUBO board since 2013, and was the EACUBO board chair from 2015–17. She also served as a board member on the Community Foundation of Howard County from 2012–18, and a number of other nonprofit boards and committees. The NACUBO vice chair for 2018–19 is Lynn Valenter, vice chancellor finance and operations, Washington State University, Vancouver. Robert Moore, senior vice president, finance and administration, and treasurer, Colorado College, Colorado Springs, will serve as secretary. As colleges and universities continue to tackle top issues, NACUBO continues to develop webcasts that aim to help colleges and universities navigate in these key areas. As part of its ongoing efforts to provide business officers with varied perspectives on the political climate and potential budgetary, tax, and regulatory changes, NACUBO continues to offer its popular, free, 30-minute webcast series, Legislative Lunchcast: A Washington Update From NACUBO. The latest episode aired on June 20, and provided an outlook on cybersecurity, the federal budget for student aid and research, the reauthorization of the Higher Education Act, and regulatory developments on financial responsibility and state authorization. An institution’s procurement team typically manages the second largest addressable spend in the enterprise; therefore, supporting and advancing this function will not only lead to cost savings, but can also lead to more revenue opportunities, a reduction in enterprise risk, and a happier campus constituency (that is more likely to actively engage in procurement). Colleges and universities are embracing analytics and using data, technology, and specialized knowledge to answer questions, reveal institutional needs, predict outcomes, or improve financial performance. NACUBO’s all-new Integrating Analytics Forum, to be held November 29–30, at the Renaissance Phoenix Downtown, was developed to help business officers tackle their data and integrate the use of analytics to inform decisions that meet institutional goals. Topics such as program margins, activity-based costing, data governance, student success, data visualization, student retention, benchmarking, resource allocation, financial aid decisions, and more will be addressed. Case studies and campus expert panels will provide institutional relevance. Designed for chief business officers, financial managers and administrators, institutional researchers, planning managers, and budget managers, the program will help attendees learn how to demonstrate an understanding of data visualization concepts and principles, recognize analysis techniques that turn data into information, and identify how to integrate the use of analytics to improve resource allocation decisions. New: Integrating Analytics Forum to be held November 29–30, is soliciting proposals for educational content that spotlights innovative approaches in enhancing the quality, reliability, and consistency of data to achieve institutional goals. Endowment and Debt Management Forum to be held Feb. 13–15, 2019, is looking for corporate showcase and educational abstracts dealing with issues that address the broad range of financial skills needed to handle the increasing complexity of the higher education business model. We invite you to propose a session that is relevant, innovative, and useful. Share your approach, knowledge, and experience, focusing on strategies and tactics that will resonate with a higher education audience. Take advantage of the opportunity to advance the conversation, network with administrative colleagues, and highlight best practices. For more details, including topics of particular interest and submission guidelines for each program, visit www.nacubo.org and click “Submit Content,” under the “Conferences & E-Learning” tab. The Key Facilities Metrics survey, a collaboration between APPA and NACUBO, gathers basic data on BTU (energy), electrical, water, waste (recycle and garbage), and carbon. These metrics help campus leaders better understand their institutions’ consumption and improve strategic planning. Last year, more than 360 institutions participated in the 2016–17 survey, which marked its fourth year. The simple questionnaire allows institutions to mix and match their data by ratio of students, square footage, region, or institutional classification. To view individual institutional results, visit the APPA website; median survey results can be viewed by visiting www.nacubo.org/keyfacilitiessurvey. Survey participants will be able to launch different dashboards and view metrics from each section of the survey; nonparticipants will have more general access to the regional and institutional ranges. To complete the survey, you will need information that can be found on vendor and utility bills. For more information, contact Sally Grans Korsh at 202.861.2571.